Walking aids are sometimes also reffered to as ambulatory assistive devices. A walking aid is one of several devices a patient may be issued in order to improve their walking pattern, balance or safety while mobilising independently. They can also be a means of transferring weight from the upper limb to the ground, in cases where reducing weight bearing through the lower limb is desired. The distal tip of canes and crutches should have a rubber ferrule to prevent the walking aid from slipping, with some ferrules being depressed to form a vacuum when it comes into contact with the ground. The ferrule should not be worn or cracked and should fit well onto the point of the walking aid. Although often a solution to mobility issues, walking aids do come with their own mix of benefits and challenges to the individual using them. As such, prescription of walking aids should ideally be done by a physiotherapist after a thorough assessment of gait, balance, cognition and the cardiovascular, musculoskeletal and neurological systems. Assessment should also take into account any clinically significant co-morbidities and the individual's day to day mobility requirements e.g. community ambulation, navigating steps or public transport. 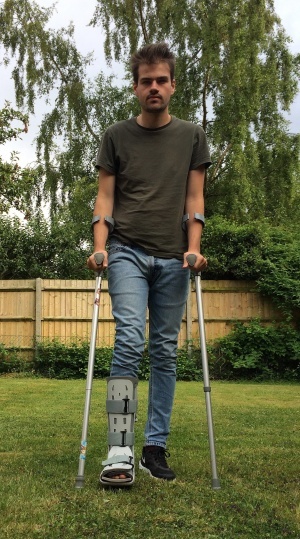 Thought needs to be given to whether the walking aid is a temporary requirement e.g. post fracture or a more long-term option e.g. a walking frame for an elderly adult with reduced mobility post stroke. Physiotherapists should also be aware of the perceptions of walking aids can be negative at times as individuals may feel like they are giving up their independence or fear they will look frail. In such instances, the physiotherapist needs to balance the individual's concerns with safety, encouraging the individual to consider the walking aid as keeping them mobile and able to participate in their daily activities. Follow up is also needed after an initial assessment and prescription in order to adjust the walking aid as needed. Although beneficial for stability and balance, walking aids can be difficult to use which is associated with falls. See the canes, crutches and walkers pages for further detail. Full weight bearing (FWB): There are no restrictions and client can bear 100% body weight on the lower extremities (LE). Weight bearing as tolerated (WBAT): Weight bearing is limited by patient tolerance of weight borne on extremity. ↑ Allet L, Leeman B, Guyen E, Murphy L,Monnin D, Herrmann FR, Schnider A. Effect of different walking aids on walking capacity of patients with poststroke hemiparesis. Arch Physi Med Rehabil. 2009; 90 (8): 1408–1413. Accessed 1 February 2019. ↑ Gooberman-Hill R, Ebrahim S. Making decisions about simple interventions: older people's use of walking aids. Age Ageing, 2007; 36 (5): 569–573. Accessed 1 February 2019. ↑ Bateni H, Maki BE. Assistive devices for balance and mobility: Benefits, demands, and adverse consequences. Arch Phys Med Rehab. 2005; 86 (1): 134–145. Accessed 1 February 2019. ↑ O'Sullivan SB, Schmitz TJ, Fulk G. Physical rehabilitation. FA Davis; 2013 Jul 23.